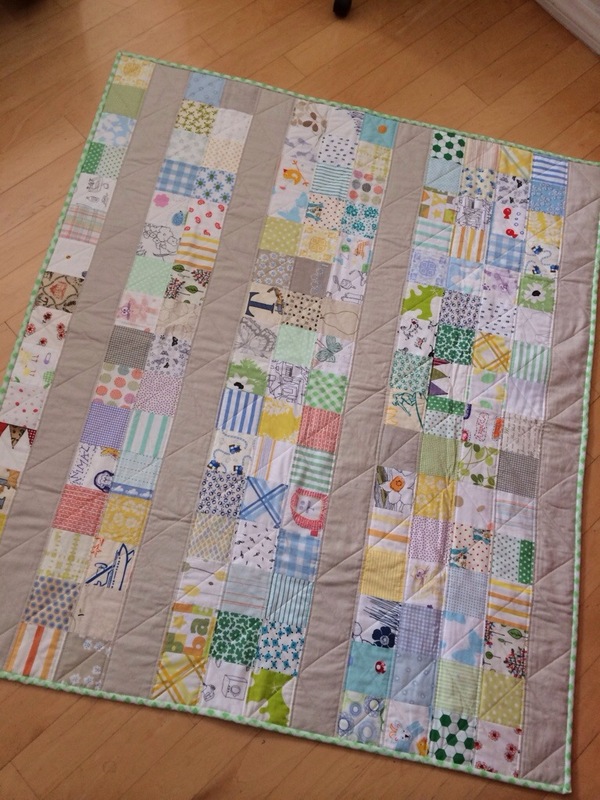 This is not a second baby quilt I ever made. It is the second quilt I made cutting a bigger quilt top, into 2 baby quilts (take a look at the first one). I finished a bigger quilt top, set it aside waiting for an appropriate backing fabric to appear, when I realized I need a baby quilt for my son’s teacher in two days. The quilt top as it was, was way to big for a baby quilt, but cut simply into two pieces, it was too, small. Too narrow. 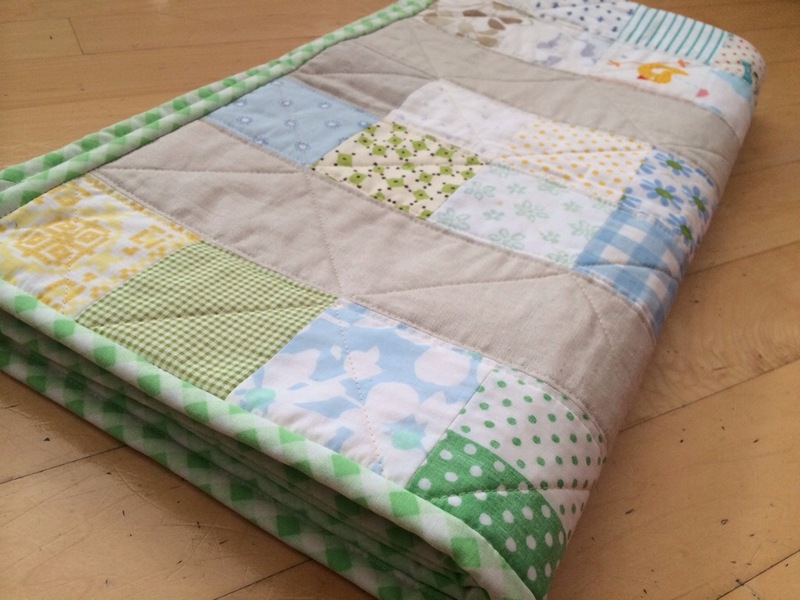 The solution was to add some linen – for the first one, I added a single strip to widen it. 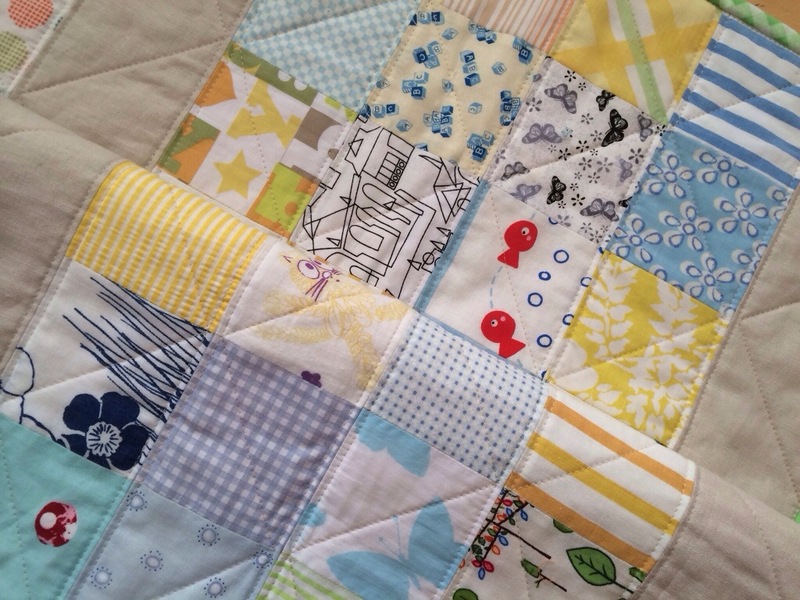 For this one – which was even narrower, I added a few strips of linen between strips of squares of varying widths. I planned to quilt straight lines along the width and length of the quilt, 1/4 in on both sides of seams, as I usually do when I have a simple grid like this. There was a problem however…. 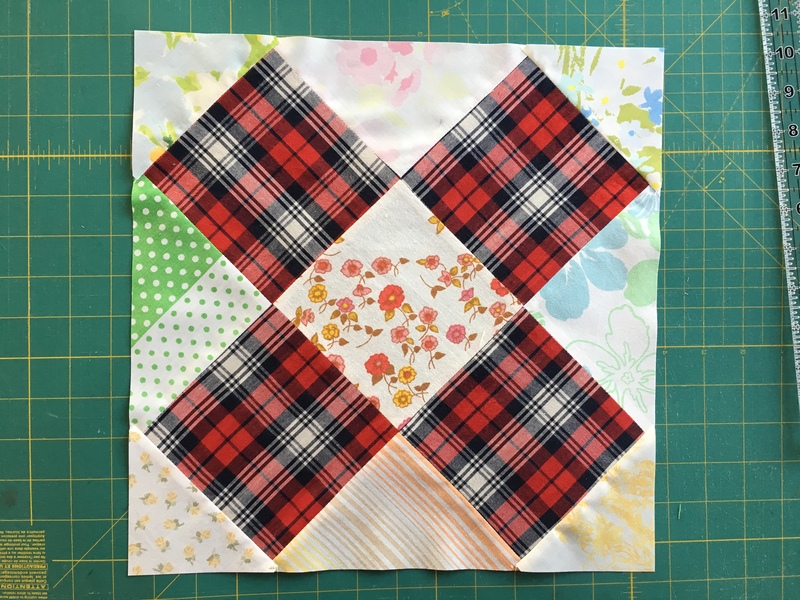 when I separated the strips of squares and added the linen between there was some distortion and the corners didn’t match anymore – so I could not quilt straight lines across the width, crossing the linen strips. They were not straight lines. I couldn’t even quit diagonal lines, for the same reason. I ended up quilting next to seam lines vertically, and then zig-zag lines down the strips. The backing is a simple orange seer sucker fabric. 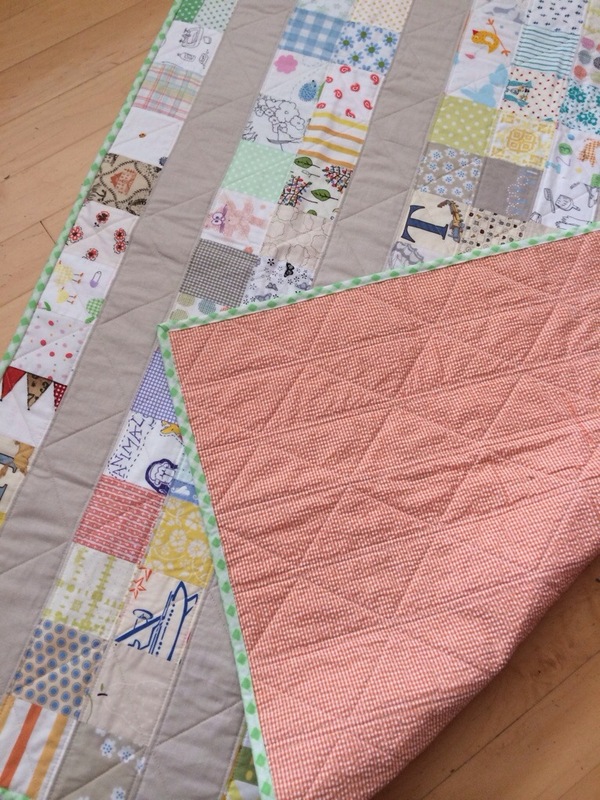 You can see the quilting lines better here. I do like binding… I used a thrifted sheet. It was a little thick to work with, but looks very nice. And I do like the fabrics I chose. well, most of them. In retrospect, it took too much time to select all these fabrics to then get to a not so satisfying result. Oh well. Finished size: 43 x 49 in. 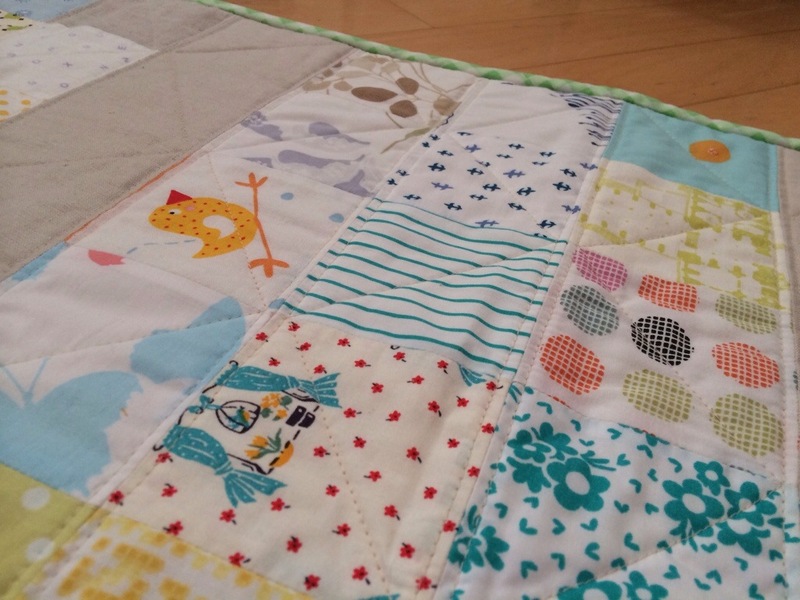 This entry was posted in 2014, finished, quilting and tagged Baby Quilt #2 on March 3, 2014 by flekka.